You've probably heard of open source political compass. I was trying to map North American politicians. Mainly because a lot of people don't seem to be able to tell the difference between a liberal, a democratic socialist, a socialist, and a communist... nor do they know what a conservative is (this includes most people who call themselves "conservative" these days, they're really right-wing populist and some neocons but they're being driven out). People say Obama is a socialist or communist, he's not. He's not even leftist. That's why I did the map. But I had to use Mitt Romney for the GOP because the 2016 candidates are so incoherent I couldn't map them. Here's is my map showing US and Canadian party leaders. In NHB, there's pinned thread inviting everyone to take the test to find their location on the political compass. I test a little left of Thomas but on the same level. But I suspect that particular test is too simplistic. I took the test several times, over a period of months, so I would be less likely to remember my previous answers. I stayed in the green quadrant but moved somewhat each time. 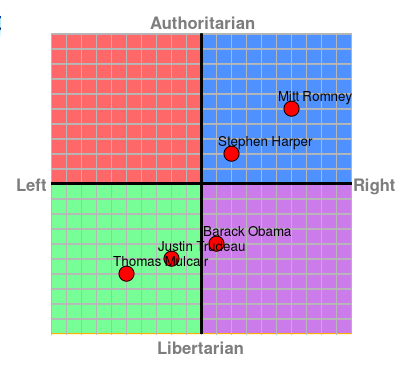 Despite any shortcomings, the test has been roughly accurate in showing where many members stand on the political compass. When I post regularly in NHB, I find I get some insight into the anti-intellectual attitudes of non-elite Republicans. Maybe they can't tell a Liberal from a Democratic Socialist, from a Socialist, from a Communist. But then again, most have no interest in finding out. They identify tribally, with each other and they have been conditioned to scorn anything scientific or intellectual. They copy their talking heads and do their best to disrespect and mock Liberal NHB participants. Most of these obstinate boors in NHB are right wing populists who consider themselves far right Conservative. So because Obama (or Trudeau) is far to the left of them, they mock him as a Socialist/Communist. The main thing for them, is to flaunt their insincere mocking/bullying and disrespect. They do it equally to left wing politicians, pundits and left leaning Liberal Forum members. Some Liberals who post in NHB fight back effectively. But the original provocation always comes from the right wing populists. I am also slightly to the left of Thomas Mulcair, but I cannot bring myself to support his political party because they seem so angry all the time. They have good ideas, but their tone just turns me off. Their old leader was good, though, not angry. Most of these obstinate boors in NHB are right wing populists who consider themselves far right Conservative. So because Obama (or Trudeau) is far to the left of them, they mock him as a Socialist/Communist. The main thing for them, is to flaunt their insincere mocking/bullying and disrespect. They do it equally to left wing politicians, pundits and left leaning Liberal Forum members. Some Liberals who post in NHB fight back effectively. But the original provocation almost always comes from the right wing populists.